Steamers departing Port of Miami for Havana in the early 1900's. 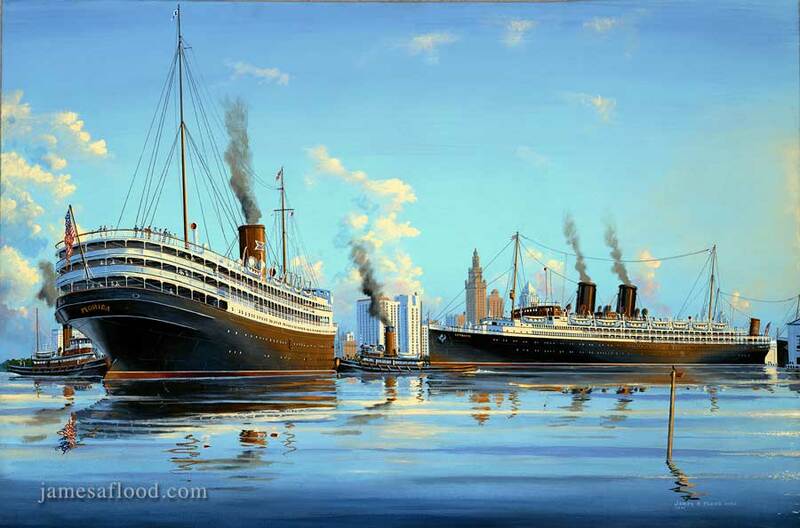 In this painting liners SS Florida (P&O Line) and SS Iroquois (Clyde Mallory Lines) are depicted departing the old Port of Miami in the mid 1930's. In the background lies the Miami Skyline, the Miami News Tower rising visibly behind the mid-bow section of Iroquois, while just over her bridge the brand new courthouse can be seen. Betwixt it all tugboats can be viewed pushing SS Florida from the bow and stern as they maneuver her towards the channel to head her out to sea.